KoopaTV: Paper Mario: Color Splash — Episode 5: Illusion! By LUDWIG VON KOOPA - Showtime in the Green Woods. This week's episode of Rescue V, the mostly-weekly showcase from Nintendo of five coloured Toads asserting that they are the true protagonists of the fast-approaching Paper Mario: Color Splash, is supposed to focus on Rescue Green. Let's face it. Rescue Green is so low-energy that he sleeps (or rests his consciousness) throughout his entire episode. This means the other Toads have to pick up the slack. Prior to this episode, Rescue Green already was the biggest mystery of the Rescue V, with the least in-episode appearances and the least known about him. That's...still the case. Just what is with this guy? ...Well, we still don't know, and we won't figure out by me staring at the screen for an hour. So let's just talk about Lemmy Koopa. 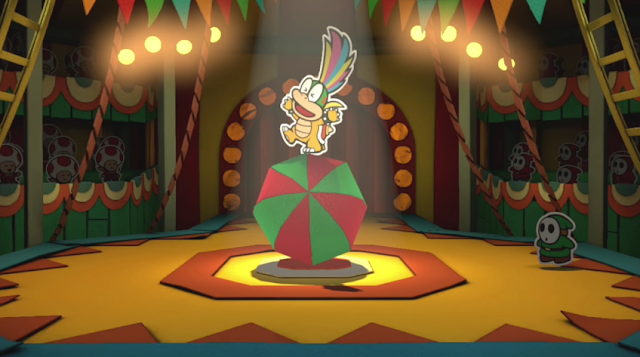 I cannot un-see that Lemmy Koopa is balancing on an open parasol, not a ball. Everyone who knows Lemmy knows that he loves the circus environment. It's just a basic facet of his personality. He's been balancing on balls all his life. So, similar to how Morton is a moron addicted to black paint; how I, Ludwig, ride a pirate warship; and how Iggy rides a Chain Chomp chariot and Kamek makes random cameos; Lemmy develops and maintains his character traits in Paper Mario: Color Splash. Unlike the other episodes, the Rescue V never discussed their actual contribution to acquiring a Big Paint Star or defeating any Koopalings. In fact, they never identify the circus in the Green Woods as a place with any interesting loot for the plumber and his Toad masters. Lemmy never seems to actually be in any danger throughout this. He's just a ringmaster. That's his dream! There are still new, never-before-dreamed things to come, though. 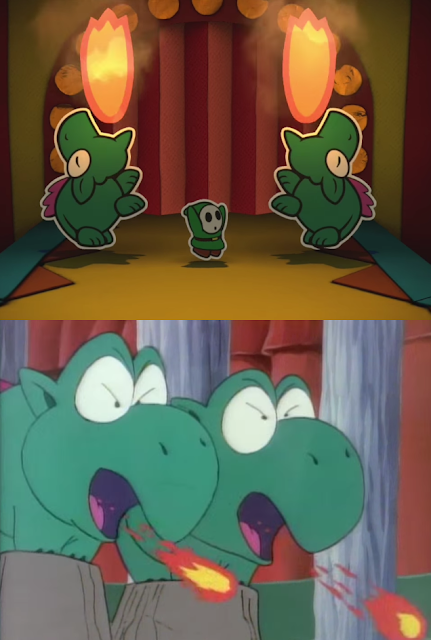 For example, did you expect a Yoshi to do THIS? 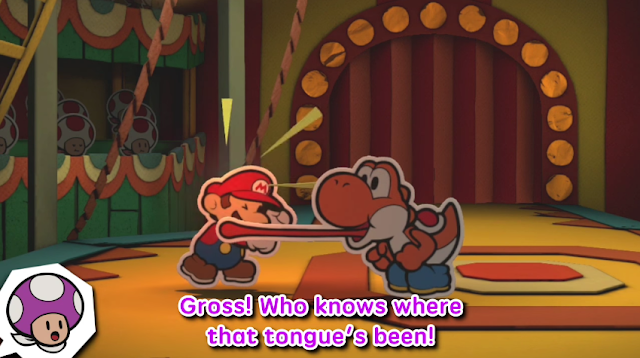 Well, Yoshi's actually been dreaming to give the plumber a tongue-lashing all his life. The whole atmosphere seems to be a reference to Super Mario World, and the cartoon episode “Send in the Clown”, though Lemmy's cartoon counterpart, Hip, didn't show up in that episode. You got a circus ran by Koopas that has a high attendance of suckers, with Dino Rhinos inside ready to make the show exciting. Two Dino Torches breathing fire in the circus! Despite the promise of an awesome show, this was a pretty weak episode. No wonder Rescue Yellow recommended that we skip it at the end of the previous one. Hopefully, Rescue Purple's is strong! I wonder which of my siblings might show up to that? Paper Mario: Color Splash releases this October 7, and the Rescue V episodes and KoopaTV's coverage of it may soon come to an end. KoopaTV will be there when that end happens, however. Did this episode change any opinions about Paper Mario: Color Splash? Let KoopaTV know in the comments section! Rescue Purple's Episode 6 is here, and it's even more irrelevant filler. Those Yoshis exist for consumption. Ludwig doesn't like the circus, especially the Berry Big Circus. Are you going to review Color Splash once it comes out? ...Can you tell I don't really like to review stuff?